Provide comfort for the family of Maryann Ignico with a meaningful gesture of sympathy. 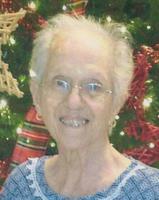 MARYANN IGNICO, 80, of Holly Hill, FL, passed away on Thursday, January 10, 2019, at home. Maryann was born in Bronx, NY, and resided in Jackson Twp., NJ, prior to settling in Holly Hill. She was employed as an assembler for DPT Labs, Lakewood, NJ, prior to her retirement. Maryann was a loving mother, nana, and friend, who will be missed dearly. She was predeceased by her parents, Frederick and Margaret Macli; and by her husband, Francis A. Ignico in 2001. Maryann is survived by her daughters, Diane Pomponio and Patty Roman; her sons, Frank Ignico, and Robert Ignico and his wife Dodi; her 5 grandchildren; and by her 8 great grandchildren. Relatives and friends are respectfully invited to attend her visitation from 4-7:30 PM followed by her Funeral Service at 7:30 PM on Monday, January 21, 2019, at the GEORGE S. HASSLER FUNERAL HOME, 980 Bennetts Mills Road, Jackson Twp., NJ 08527. A funeral gathering will be offered at 9:00 AM on Tuesday, January 22, 2019, at the funeral home. Interment will follow in Brig. Gen. William C. Doyle Veterans Memorial Cemetery, 350 Provinceline Road, Arneytown, NJ 08562. In lieu of flowers, contributions may be made in Maryann’s memory to Alzheimer’s New Jersey, 425 Eagle Rock Avenue, Suite 203, Roseland, NJ 07068 www.alz.org and would be greatly appreciated. For directions, further information, and to send condolence messages to the family, please select a tab on the left. Please gather at the funeral home at 9:00 AM. Chapel Service to follow at 10:00 AM at the cemetery. Consider providing a gift of comfort for the family of Maryann Ignico by sending flowers. Provide comfort for the family of Maryann Ignico (Macli) by sending flowers.